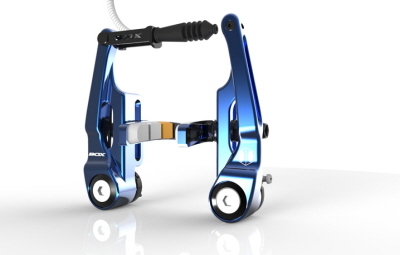 Included are color-matched X-Ray brake shoes developed specifically for the Eclipse brakes. The new, proprietary X-Ray shoes feature a stiffer cold forged and CNC-machined cartridge body, three-tone/dual-compound pads for superior braking and pivoting mounting posts for perfect pad alignment. A complete 85mm set weighs about 195 grams/6.88 ounces, while a complete 108mm set weighs 200 grams/7 ounces.